No rush, no crowds, no sea sickness. The Dive Bus guided dives are slow, easy, beautiful and relaxed with bottom times up to an hour (air-willing). Dive briefings include tips and tricks to help you spot Curacao’s marine life and understand more about what you’re seeing. And we’ll give you pointers on how to enjoy your diving safely and without damaging the beautiful fragile underwater environment. So hopefully you’ll get more from every dive you make, not only those you make with us. 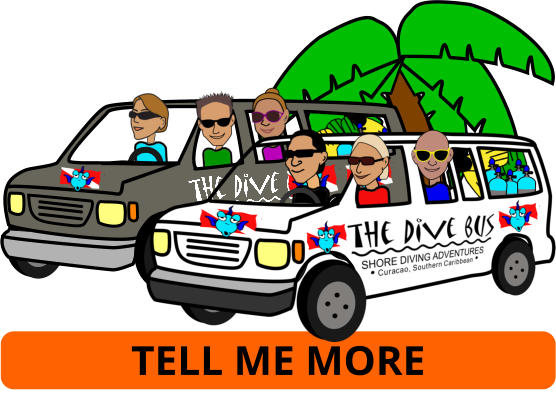 The Dive Bus reef is particularly stunning at night and definitely worth checking out... The Dive Bus night dives include a cold beer or hot chocolate to perfectly round off another wonderful diving day in Paradise. If you're PADI Advanced Open Water certified, Fly the Reef from Pierbaai Reef to Car Pile on a 1 tank guided dive like you've never done before!